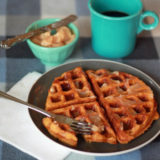 Fall spices warm these festive pumpkin waffles, made even better with a sweet cinnamon honey butter. I’ve always been a nester, long before all the crazy hormones of third-trimester pregnancy kicked in. Of course, now that I’m feeling even more nest-obsessed, I haven’t yet experienced that famous blast of energy. Kind of the opposite, actually. So I sit on the sofa cuddling with our golden retriever pup Daisy, and I nest in my head. Oh, the ideas! I should probably write them down, though, because Pregnancy Brain is definitely a real thing. I have no idea what brilliant idea I had 30 seconds ago. Well … I take that back. I do remember these waffles. We enjoyed them last weekend, and I wish we had more to scarf down now. It was breakfast time, a half-can of leftover pumpkin puree was hanging out in the fridge, and I had a little bit of rare energy. Pumpkin waffles it was! This version, Spiced Pumpkin Buttermilk Waffles, is colorful, full of flavor and packed full of warm spices. 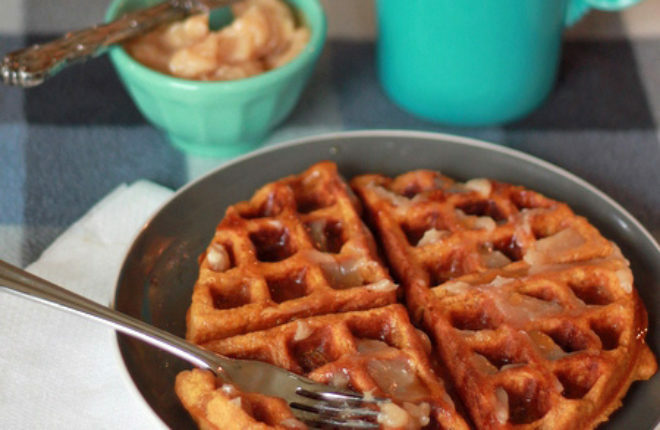 When topped with delicious Cinnamon-Honey Butter it’s breakfast nirvana. Especially for a prego. They’re special enough for company but I think kids will love them to. I’m pretty sure mine requested more, even in utero. How convenient for me! Melt the unsalted butter and set aside to cool. In a large bowl, mix together the flours, baking powder, baking soda, cinnamon, nutmeg, ginger and salt. In a medium bowl, beat together the eggs, brown sugar, pumpkin puree and buttermilk. Add the cooled melted butter. Pour the wet ingredients into the dry ingredients and whisk together just until all ingredients are incorporated. Follow your waffle iron instructions for baking. Mine takes about 2/3 cup batter and about four minutes to cook. While the waffles are baking, mix together the butter. 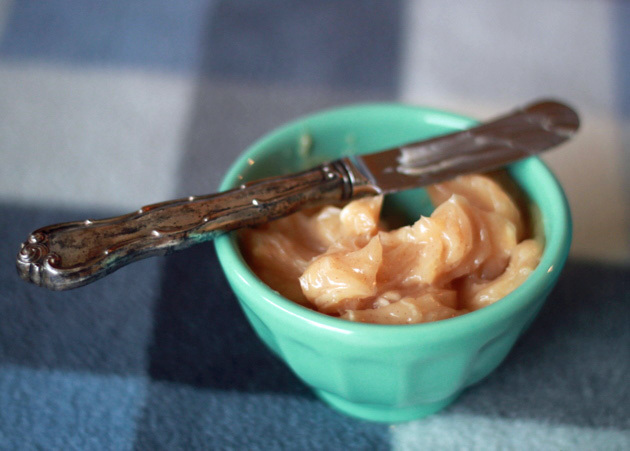 Add all ingredients to a small bowl and mix together with a fork or small whisk. 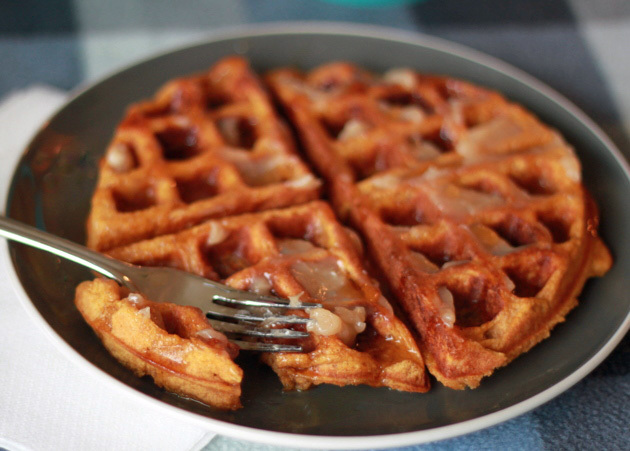 Serve waffles with Cinnamon-Honey Butter and maple syrup.